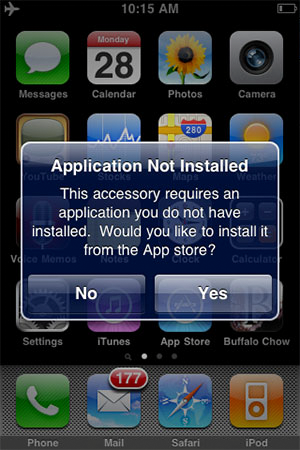 At least one third-party iPhone and iPod touch hardware accessory now reportedly takes advantage of the 3.0 software connectivity with automatic App Store download prompts. One of the first accessories to sport the new feature is the new iTrip with App Support from Griffin Technology. First discovered by iLounge, the new capability automatically informs users that the necessary application is not installed on the iPhone or iPod touch. It then offers to connect to the App Store and automatically download the software, with the user's permission. "Upon acceptance, the iPhone or iPod touch then takes users to a new 'For This Accessory' page on the App Store, with a direct link to the necessary apps listing, from which they can download and install the application," the report said. At Apple's Worldwide Developers Conference in June, Apple highlighted a number of third-party applications that take advantage of iPhone OS 3.0 to connect with external hardware. Among those highlighted was the TomTom Car Kit, which features an external GPS receiver that boosts reception. The hardware, which will be released in October for $120, will work with the separate TomTom app and be compatible with the iPhone 2G, 3G and 3GS. Other demonstrated connectivity included AirStrip CC, a medical accessory that can take live sensor data and make it available over the Internet, and guitar amp controls from Line 6/Planet Waves. This week,ZipCar released its new application for the iPhone and iPod touch. Also demonstrated at WWDC, the software uses the location of the phone to provide local search for common transactions, like reserving cars and viewing, extending or canceling reservations. Connected vehicles can also be unlocked or the horn can be honked remotely to help users find their vehicle. The car-sharing service is available in various U.S. cities and universities. In June, Belkin introduced one of the first 3.0 compatible accessories for the iPhone and iPod touch. The TuneCast Auto Live FM transmitter works with an accompanying ClearScan Live application to allow users to control which FM station to transmit through. It also uses the GPS capability of the iPhone to locate unused stations in the area. But previously, connecting hardware did not automatically prompt users to download software from the App Store. The new accessory from Griffin is the first reported to do so.